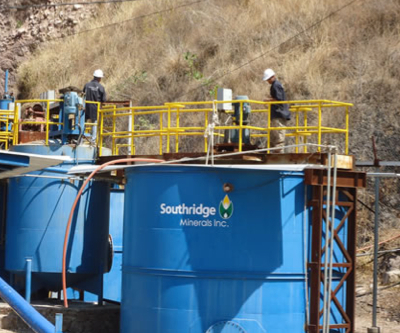 Two men, reportedly the CEO and CFO of U.S.-based exploration firm Southridge Minerals (PINKSHEETS: SRGE), have been found dead in a river in Mexico, local press reports. The bodies, corresponding to two men in their late 30s, were found by farmers who also recovered documents with the names of Michel Davies and Derald Johnston, which are the names of Southridge Minerals’s CEO and CFO. However this information has not been officially confirmed. The company has been involved in a recent controversy over its rights over the Cinco Minas project. The conflict worsened early this month, after a Canadian junior released an independent report revealing that Southridge’s Cinco Minas property has been non-operational for the past several years. The Dallas-based firm, however, says in its website that it paid $7.5 million for exclusive concessions to mine the Cinco Minas and Gran Cabrera sites respectively located 100 and 135 kilometers northwest of Guadalajara in 2010. This fact is disputed by Bandera Gold, which claims ownership of both mines and displays the concession certificates on its website.